Maenam Beach, On the north coast of Samui is a five-kilometre golden white beach devoid of noisy bars and clubs. It is too quiet that it attracts mainly families and couples out for a good, tranquil swim. The sand is not as smooth as Chaweng's and the sea not as shallow, but it provides a quiet and remarkably tropical feeling. It is a great place to go windsurfing, especially in November and December. 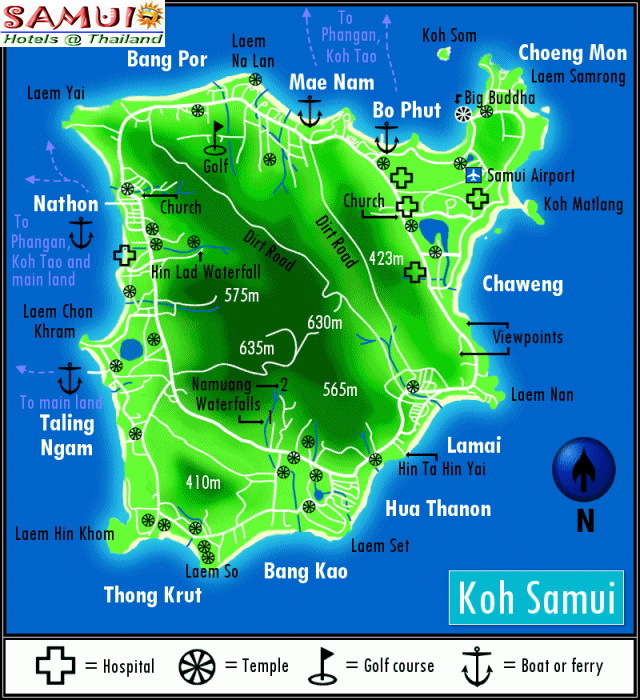 Maenam Beach is very much unlike any of the island's popular beaches that it has earned the moniker Samui's "undiscovered beach". And that's ironic. Some of the first ever tourist bungalows on the island were built here. Sunset at Maenam Beach is spectacular; it offers a dramatic view of the neighboring islands, Koh Pha-Ngan above all. Those expecting wild fun would be disappointed. Maenam has almost nothing in terms of nightlife. But anyone desperate for night action can always go to nearby Chaweng, only ten minutes away by car or motorbike. Apartment Room , A/C, Fan, Hot shower. Comprising of studio, deluxe studio, junior suite and executive suite. Fan and A/C bungalows directly on the beach. The advantage has that from the nature and mountain, get the character of a room goes out 3 models. Small idyllic resort and quiet beach. All 28 Villas are designed spacious and reflect the rich traditional Thai culture. 55 Cottages, 14 Privates Villas. Every room type provides "Jacuzzi system" in bathtub or private pool. Harmony with nature alongside a spectacular 152 meter long beach front and features 53 traditional designed boutique villas. All rooms have air-conditioning, satellite TV, phone, refrigerators, and hot water. All 36 of our private pool villas and suites are consisted of one, two and three bed rooms. 6 Double Bungalows can accommodate from 1 to 4 people. With 10 standard and 9 superior bungalows, All air conditioned with hot&cold shower, refrigerator, mini bar and 32 channel TV. 24 Hotel rooms & 21 Bungalows at a quiet beach. The resort is right on the sands and enjoys stunning views of Maenam bay and the offshore islands. 11 Thai Style bungalows, 70 Deluxe rooms in Thai Style Buildings, 10 Garden Deluxe rooms in Thai Style Building, 6 Suites with pool / seaview. All rooms have a balcony or terrace facing to the pool and have modern facilities as mini bar and safety box.